A: Scratching for kitties is a normal, healthy behavior. It is also a social behavior. A cat will scratch, or want to, when they anticipate something good, such as your waking up in the morning, anticipating breakfast, before a play session, before greeting you, when you come home or enter a room, and so on. If you are bonded with a kitty, often the kitty will get excited and scratch in anticipation of a positive interaction or greeting from you. Because scratching is a social behavior and a rewarding behavior, and is an innately ingrained behavior, reprimanding your cat or squirting your cat with water, shaking a can with pennies and so on, will not work. Your cat will still feel the need to scratch. If you use aversives i.e., scolding, yelling, shake cans or squirt bottles, your kitty will fear you or the situation and run away. You did not mention the age of your cat. Young cats will scratch rather frequently, especially before play or in anticipation of play and hunting (before hunting the lint roll, pen cap, for instance, or climbing the curtain rods). Cats have preferences as to what surfaces they scratch on. Most scratching posts and boards available in pet stores are not appealing to cats. The sides of most sofas are. Cats like textured surfaces, such as tapestry, heavy textured cotton, wicker, and berber. In addition, the visual scratch marks a cat makes after scratching encourages the cat to scratch there again. The more tattered and shredded the scratching post, the more inviting it is to the kitty! Cats tend to scratch vertically. Most scratching posts are too short for most cats since when cats stand on their hind legs, they tend to be taller than most posts. A scratching post should be at least 3-4 ft in height. Also, cats need solid surfaces to scratch on since when they scratch they use their weight, as well as their claws. Sofas are a perfect height and solid. Most scratching posts are made of cardboard. They are narrow, tippy and flimsy. Not at all appealing to a kitty. If the scratching post rocks or sways or nearly falls over when your kitty tries to scratch on it, your cat will find a better alternative. To make matters worse, many scratching posts are made of plush carpet with glossy faux wood bases. Although these can look nice in modern apartments or houses, they are not at all appealing to a cat. Locations are also important. Cats prefer to position themselves where they see all entries and exits of an area. They want a nice vantage point or peripheral view. Often people will have a scratching post or corrugated scratching board placed in a corner, hidden behind another piece of furniture, or flush to a wall. Most sofas and chairs are placed in locations that have nice vantage points or views of the room, and entryways and exits. If you have a great scratching post in an unusable or unattractive location, your kitty will not use it. 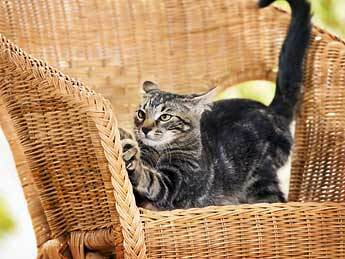 To deter your kitty from using the sofa, trim or cut all tassels or frayed edges. If it is a wood surface, such as a table leg, use sand paper and some wood stain to smooth the area. Spray some Feliway (a phermone available in many pet supply stores) on the scratched area. If you can easily reposition the chair or sofa so that the vantage point is less appealing to your cat, do so. This will help. You can also block access to the area your cat scratches on by putting another piece of furniture in front of it, such as a coffee table or end table, or a large plant. This is also a good location to place a really good scratching post. Next, invest in a few good cat scratchers. More than one is preferred. A good scratching post will be large, sturdy, made of wood and textured — berber, sisal, coir, or textured wood. If it is a vertical scratcher, it needs to be at least 3 to 4 feet tall. The wider, the better. If you use a cardboard scratcher, make sure it is as wide as possible. These are sometimes called “double wide.” Narrow floor scratching boards are unappealing to cats, as are skinny or flimsy scratchers that hang on door knobs or walls. For floor scratchers, invest in some coconut or sisal throw mats. Make sure the mats are heavy. You can make your own vertical scratcher, if you have the means, by nailing a large piece of wood or cut log to a heavy, solid wood base, or by securing 3 to 4 cut 2×4’s together and onto a large, heavy wood base. You can then wrap the 2×4’s with sisal or rope. Put the scratching post in front of the area your cat normally scratches or place the scratcher so that it is in a strategic location, such as a hallway, entry to a kitchen, in the living room or social area, and with a nice vantage point (from your cat’s view). Do not position scratching posts or mats in corners, hidden behind other furniture, or flush against walls. Play with your kitty around the posts and add catnip to them. Encourage your kitty to scratch on the posts by mimicking scratching yourself. When your cat scratches the post, praise your kitty. Rewarding with treats is also good. If your kitty scratches the sofa, or an area you dislike, be calm and unemotional, and simply remove your kitty from the sofa area or chair, redirect him or her to the scratcher, or divert your kitty’s attention to something else. Another alternative to prevent scratching on furniture is to buy furniture or slip covers made with smooth fabric, such as microsuede. Smooth, soft and plush fabrics are less appealing for cats to scratch on, which makes these types of sofas and slip covers ideal. As a final caveat, never declaw your kitty. It is an incredibly painful and invasive procedure (It is actually the amputation of the distal phalanges or toe bones). Besides from pain and complications that can last for months and sometimes years (botched up surgeries are not uncommon), declawing can create other behavioral problems, such as general timidity, avoidance of owners, hiding and retreating, biting, especially associated with play aggression, and too many times, failure to use the litter box. Declawed kitties will tend to orient to carpet or softer surfaces rather than litter. 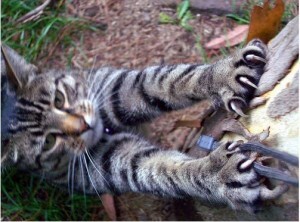 Declawing also inhibits play and paw/digit dexterity and mobility. A kitty who is declawed cannot grab onto toys or objects, and often declawed kitties get frustrated playing. Chris Gruschke I drive crazy when I hear something about declawing. What a pervers person must have had such an idea? They should pull the fingernails of these people and the vets which do that should get into prison. In Germany it is not allowed. God thanks. How is it possible that people can do something like this? If they love the furnitures so much they should not have a cat. A cat lover will never have such an idea !! These people don´t love their cat. I really get mad about that. Why is declawing even legal? If other countries say that it’s illegal. Why can’t it be illegal here too? This is why i hate humans. They think they know what’s right for animals when they don’t. I have found the coir mats to be the only surface my cat will scratch instead of my furniture and other objects I’d prefer not to be clawed up. The problem is, I cannot find a coir mat that does not make a huge mess, scratching or no scratching. I recently received a few samples from American Floor Mats which I am very disappointed to discover the samples shed just as bad if not worse than any of the other mats I have used so far. I have some new wool carpets and recently did a full renovation to my home so I am afraid to experiment with other materials such as suggested sisal, etc. My question to you is, what is the most sturdy non shedding coir mat you know of and where can I find it. I have not committed to buying anything new yet, still using the old messy mats I currently own. There is a rather large difference in cost of these mats and I have not been able to find much in terms of which mats hold up best to scratching. Some tout not to shed much such as the American Floor Mats, historically I have found them to still be very messy leaving piles of coir fibers surrounding the mat and tracked and blown across my hard wood floors. It seems as though as soon as I get the mess cleaned up to the best of my ability, almost automatically strands of coir have found their way all over the place again, like I mentioned, sans scratching. I depend on these mats though, they do preserve my furniture and I clip my kitties claws as much as possible.